Successfully saved Honey Mustard Chicken to your Calendar. You can also save the ingredients to your Grocery List. 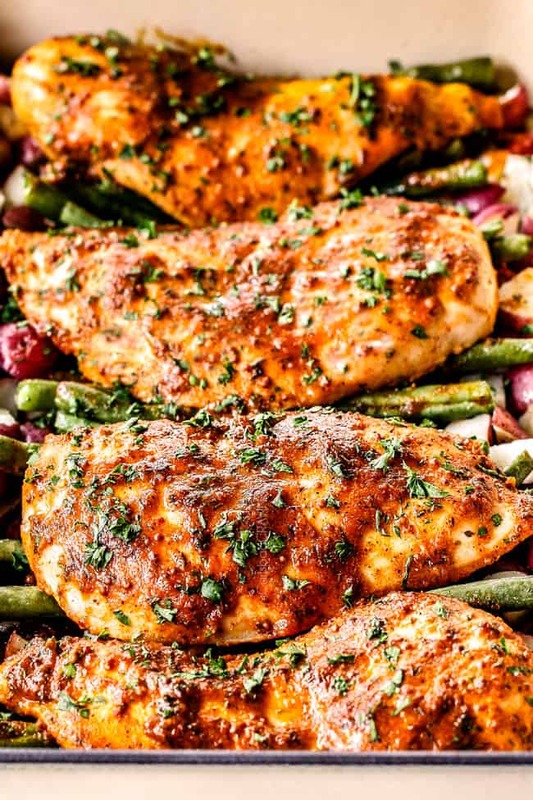 Baked Honey Mustard Chicken with OPTIONAL potatoes and green beans is a a no-fuss, one-pan-meal! The chicken breasts emerge outrageously juicy from a quick brine and then are slathered in a spice rub and smothered in the BEST honey mustard sauce - no boring, one note honey mustard chicken here! The potatoes and green beans are tossed with salt and pepper then seep up the honey mustard drippings of the succulent baked chicken. You can prep the entire dinner ahead of time then refrigerate and bake. Did someone say winner, winner chicken dinner?